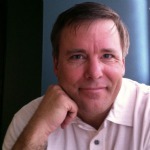 There are any number of books – thousands, really – that will give you advice on how to build a business. But nowadays, that’s not enough. How do you build a community? 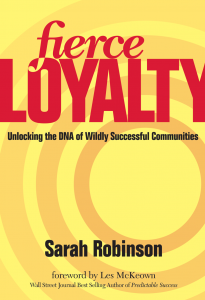 That’s the topic Sarah Robinson is addressing in a brief but meaty e-book called Fierce Loyalty. I talk a lot about professional DNA at the individual level – Sarah scales up to examine something equally vital: the DNA of successful communities. Building and sustaining a fiercely loyal community of clients, customers and raving fans is critical for success in today’s turbulent marketplace. 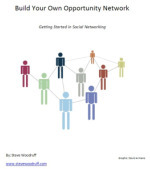 Organizations, both corporate and non-profit, that are thriving have discovered a secret – the underlying DNA shared by all wildly successful communities. Fierce Loyalty unlocks this secret DNA and lays out a clear model that any organization of any size can follow. Business strategist Sarah Robinson helps you break down the process and gives you clear, specific steps for a fiercely loyal community squarely in the center of your business plan. Drawing on her own extensive experience as well as her research into the inner working of some of the most successful communities around, Sarah de-mystifies the process and gives an actionable model along with real-world case studies and action steps designed to make Fierce Loyal happen in your organization. Speaking of practical and down-to-earth, I particularly like this perspective, right up front on page 10: I learned one very important lesson as I took on the challenges of my first job. It’s a lesson that will help you face your own challenges as you build Fierce Loyalty. Once you grasp it, you’ll use it again and again and it will propel you forward no matter what stands in your path. That lesson was and is: make a decision. Every day, decide that a fiercely loyal community is your goal, no matter what. I won’t give any more away, but if you need an excerpt to whet your appetite – well, click right here! Disclaimer: I have no financial interest in this book, nor are any links above affiliate links. I do think highly of Sarah and her work, however! And, she did provide me with a free copy of the e-book to review.